What’s the deal with sugar taxes? Proponents argue expanding sin taxes like those on alcohol and tobacco, to high sugar foods and drinks will reduce consumption. Or at least raise revenue to help fund treating the negative health outcomes such as obesity, diabetes, heart disease and stroke. Sugar taxes have failed in a number of countries. They just don’t work. Most of the research to date has concluded, that while in theory a sugar tax should work, in practice there is no real decrease in consumption. That is until the most recent study on Mexico’s sugar tax and battle with obesity. With 70% of the adult population and a third of children overweight, something had to be done. In January 2014 the government brought in a 10 percent tax. A year in and sales have dropped 6 percent. It’s clear something is happening. By 2019, 20 percent of Canadians will be obese. By the same date, a full 70 percent of Newfoundlanders and Labradoreans will be obese. This is a massive burden on our healthcare system, not to mention the quality and length of life of our citizens. Cheap, highly processed foods with high sugar, salt and fat are making high numbers of people really sick. It’s true that there are many other factors affecting the health of our population, including genetics and activity levels. But it’s much like the fire triangle of oxygen, heat and fuel, where if one is removed, the fire will go out. With obesity related health issues we have genetics, calories and activity as our triangle. A wellness campaign that signals as a province, now is the time to change the way we eat and live. We could study this issue for years, put it to committee so to speak. Or we could just try a pilot and see if it works here. Sugar sweetened beverages (SSB) are the leading source of empty calories, with just one 355ml can having 10 teaspoons of sugar and no nutritional value. It’s a great place to start. Edited January 26, 2015: Based on the assumptions below the potential gross value of the tax revenue from soda is $4,345,000 – 5,830,000 per year in NL alone. So how would we get started? Department of Health and Community Services would review sugar levels within SSB and make a recommendation on tiers. Also to develop mechanism for measuring sales and/or consumption of SSB. Department of Finance would review potential tax revenue from tiered SSB tax, as well as mechanisms to implement the tax. Government would draft and pass legislation as part of budget 2016-17. Department of Agriculture would administer local produce subsidy. Department of AES and/or HCS would administer funding to not-for-profits for food skills and healthy eating workshops. 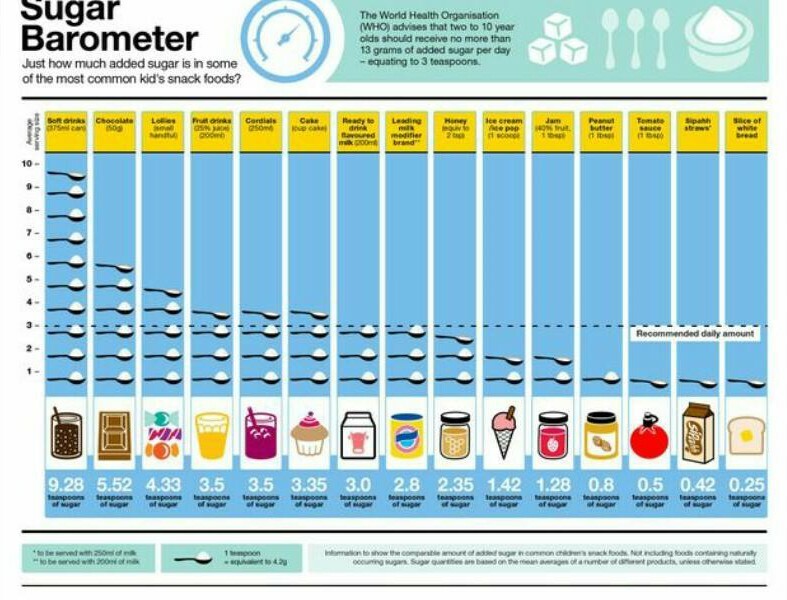 Wondering how much added sugar is in your favourite food and drinks? Next Post Taking the lens of one generation to the fiscal challenges of today.